relaine in the news - relaine - Beautiful accessories. Brilliant solutions. I was featured in the May 2015 Longfellow Nokomis Messenger. I am a member of FlourishMN, a local group of talented Etsy sellers, and we helped to organize a spring craft show at the Nokomis Community Center in Minneapolis. Have you added the first annual spring Nokomis Craft and Art Fair to your calendar yet? “With 48 vendors, a huge variety of product, and terrific events for the kids, it’s going to be a fantastic event,” promised Kate Hepp of Whoville Creations. “The range of products at the sale is huge,” she added. “From dog coats to jewelry, to ceramics, children’s toys and clothing, to amazing art. The show will truly have everything one needs for wedding gifts, graduation gifts, teacher gifts, home décor. . . The variety is fantastic and all so well made. The Saturday, May 2, 2015, event will be held at the Lake Nokomis Community Center from 9:30am to 4pm. Admission is free. Be one of the first 50 shoppers and enjoy vendor specials. Kids’ activities include make-and-take Monarch Habitat Seed Packets, and an activity sponsored by the Minneapolis Institute of Arts (MIA). There will also be a scavenger hunt with donated product from the vendors as prizes. You are invited to create crochet coral to contribute to the Minneapolis Satellite Reef. Part of the Worldwide Crochet Coral Reef project, the effort is being organized locally by the MIA. Don’t know how to crochet? Learn at the art fair. Hepp is one of the Flourish members who are helping to organize the show, which will benefit park programs. She became involved at last year’s fall show. She began talking to Nokomis Park Recreation Supervisor Maggie Mercil, who organized it, and one thing led to another. “The center has so many wonderful activities for kids and the community in general, we thought: how great would it be to raise additional monies for these activities by throwing a spring show? So we did,” said Hepp. 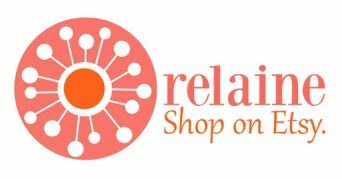 Flourish is a group of diverse Minnesota crafters that was started just over a year ago by a few local artists who sell on Etsy. 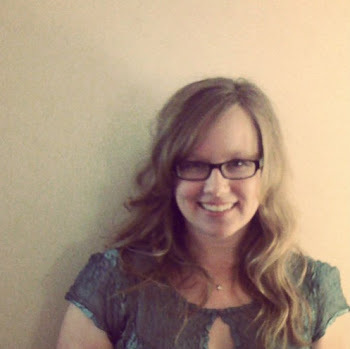 Rebecca Grothe of relaine has been a member of Flourish from the beginning. Flourish is an amazing group of talented people, and every get-together—be it a casual meet-up at a coffee shop or a structured meeting with an agenda and education—leave me feeling so inspired and lucky to have met these other creative people!” said Grothe. Add a fortune of your choice to a colorful fabric fortune cookie. Grothe participated in the Nokomis art show for the first time last fall. “I’m a huge fan of supporting all things local and it’s especially exciting to have such a high-caliber show in my own neighborhood,” pointed out Pow. Follow along on Twitter, Instagram, and Facebook via the tag #urbancraftmn. Former Minneapolis resident Rebecca Grothe of Lauderdale runs her relaine business in her free time. Her grandma, great aunt, and mom all sewed. “I don’t remember ever actually learning to sew. I just watched these women sew while I was growing up and somehow absorbed their knowledge,” said Grothe. Oskar in one of his many dragon costumes. After designing and constructing one bat costume, she was hooked. Sewing also makes her feel connected to the talented women in her family. 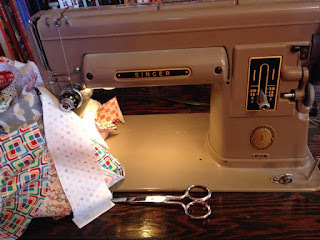 In Grothe’s studio are her grandma’s sewing table and her great aunt’s vintage Singer (which she says still sews better than any other machine she has ever owned!). Great Aunt Cleo's Singer 301A--the best sewing machine! She sells the World’s Greatest Wallets, Shopsacks, TuneTubes, card holders, zipper pulls, keychains, and customized fabric fortune cookies. “The TuneTube is a long fabric tube with a Velcro wraparound. Once you thread your earbud cords through the tube, they will never get tangled again!” promised Grothe. My TuneTube is mentioned in this article on new technologies in electronic stethoscopes! 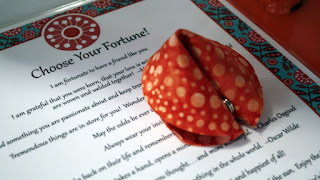 I love sewing useful and adorable things for you! ❉ I love reading, biking, shoes, cute dresses, summer, tennis, pink, and bees. ❉ I love baseball best of all.